Gender and the arms trade: what’s the link? Cynthia Cockburn is an ardent feminist and peace campaigner, involved in international feminist antimilitarist networks such as “Women in Black against War” and the “Women’s International League for Peace and Freedom”. She very kindly wrote a piece just for us! What does gender have to do with the arms trade? The best place to start might be with the smallest and most widespread of firearms – we could think about the curious affinity of men and guns. There are an estimated 650 million small arms in the world today. More than half are in private hands, and most of these gun owners are men. Men are a huge majority (around 95% in Britain) of those who commit violent crime. Men kill each other, women, children and themselves, and often their weapon of choice is the hand gun. Three major NGOs, Amnesty International, the International Action Network against Small Arms, and Control Arms, got together to try and stop armed violence by men against women. In their campaign booklet The Impact Of Guns On Women’s Lives they write that access to a gun increases five-fold the risk of a woman being killed by her husband or boyfriend. But why stop at the hand gun? We can extrapolate from the pistol to the assault rifle, the mortar, and field weapons that are deployed by state militaries and non-state militias, and imagine how many more of these are wielded by men than by women. Of those who manufacture, sell, export and buy arms, the great majority are men. So are most of those powerful people in the world who have a finger hovering over a nuclear button. But it’s not just the statistics, the “who does what” with weapons. Because of course there are a minority in all these categories who are women – the “sexual division of fire-arm violence” is never one hundred to nil. More tellingly, the connection between gender and arms is symbolic, ideological and social. It has to do with the way we live gender in our patriarchal societies. And don’t lets flinch at the word “patriarchy”. Sure it sounds old-fashioned, as if we’re talking about the grey-bearded elders of ancient times. Not so. Feudal hierarchy may have given way to capitalist class rule and the nation state. But those politicians and presidents, military chiefs and corporate executives – they still constitute a male-dominant gender order. The way patriarchy survives from one era to the next is by perpetuating a gender system in which masculine and feminine are socially shaped as opposite, as complementary, as unequal. Masculinity, and all it signifies, is valued. If a man, a corporation, a battalion, a nation state is to be adequate to power it must be manly. That’s to say it must be competitive, combative, aggressive, ready to hit back at anyone or anything that challenges its authority. In short, to hold its place in the world it must be ARMED. While there are those up there in political, economic and criminal systems who feel the need to be armed, there will be arms suppliers. So long as a lad feels a gun in his hand makes a man of him, he’ll find someone to sell him one. Now let’s build on this success and take our message to demonstrations against DSEI. As women we say the Arms Trade Fair is not welcome in London. As women we call for an end to the manufacture, sale, export and use of weapons, from the hand gun to the drone aircraft. As women we refuse and resist the kind of masculinity that sees a weapon as a badge of manliness. 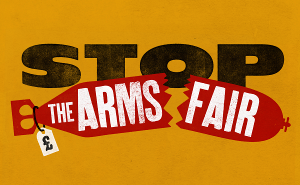 Stand together with people from across the world on Sunday 8 September, with our Occupy vs the Arms Fair event. Find out what other protests you can get involved with our Events list.